The Daily Devotional life: What it is,Why you need it and How to do it! Your daily devotional life is your springboard for developing a rich, rewarding, and productive relationship with the Lord. The key to living a life of continuous victories beyond human comprehension, is be in touch with God in a practical way, also called “fellowship of the Spirit” or “abiding in Christ”. This article is not a daily devotional. Neither is it a “how to” or some “step-by-step” mechanical guide on how to carry out the routines of a devotional. Rather, it is an in-depth summary presentation of what a daily devotional is. Though many Christians are familiar with devotional writings, not many of them really do understand what the devotional is. NB. “The Devotional Life: Your Key to a Spiritual Life with Results” was launched March 14th, 2018. The Free PDF is no longer available. Spending time with the Lord is facing a real threat of potential extinction. The demands of modern life seem to be incompatible with taking time out to spend with an invisible God. It is as though we should reconsider if prayer and meditation still belong to this age or they should be left alone with the less busy generations past. In fact, Pharaoh called the attitude of seeking God laziness in Exo. 5:17. You are idle, you are idle; that is why you say, ‘Let us go and sacrifice to the LORD’ (Exod. 5:17 ESV). Before moving any further, there are two very subtle lies we must reject from the outset. The first is that life is too busy today for God. It is true that the pace of life has increased a thousand times since Jesus’ day. Even contemporary teenagers have more crammed into a day than an entire combined household of their ancient counterparts! However, life is never too busy for God—who is life in the first place. A tree by the river never experiences dryness. Its leaves are fresh, and its fruit abundant, everyday of the year. This is the divine picture of your life-whether this is your experience now is a different question. The reason why the devotional life is crucial is because it seeks to put you in a place where you live like a tree planted by the rivers of living waters, always green and fruitful. Why is the daily devotional time under threat? But why is the daily devotional time facing the threat of extinction? While we often cite a lack of time, this is a lie I pray will be excavated from your mind before the end of this article. Though our time today is certainly under pressure, contrary to what many Christians believe, it is not the MAIN reason why many find it so difficult to establish a solid daily devotional life. I will expose five underlying causes of the lack of time available for our Creator. Your perceived priories are the most powerful personal factors dictating how you allocate your time. Your priorities are driven by your perception of need. You place more value in the activities you believe are most necessary to meet your needs or ideals of success, whether your perception is truly accurate or not. Many believers sincerely do not understand why a consistent devotional time with God is critical in their lives. An even bigger problem is our perceived need for God and His Word. Sadly, many believers still see God’s Word simply as a Christian instruction manual, rather than the source of our very life. As a result, our perceived need for God’s Word is blurred by an inadequate appreciation and understanding of the role His Word plays in our lives. The wisdom problem is closely related to our mismatched priorities and misperceived need. We need divine wisdom to discern our most important needs and set our priorities right. If believers truly grasp the impact of their relationship with God on every area of life, they will give the Word the true attention it deserves. This casualty of ministry might surprise you. Over-extending ourselves in God’s work erodes and destroys ministers’ time of intimacy with the Lord. As God’s precious children, we must never think that God called us primarily to work for Him. Our relationship with Him must have priority over the work He has commissioned us to do. While there are many enemies of our time, space allows me to mention just three of them here. Distractions are anything that come in our way to interfere with the time we set aside to spend with the Lord. The work God has commanded us to do can even be a distraction! The classic story of Mary and Martha below explains this beautifully without further comments. This silent destroyer occurs when we engage in the form of religion without the substance. The religious spirit focuses on the practice rather than the purpose of the practice. We might even begin to measure our performance based on how consistent we are in our time with God. The mindset of the religious spirit kills the quality of our time spent with the Lord. Believers with this attitude only seek God when there is a crisis. For them, God is a Problem Solver, so they only come to Him when they need answers. This is a heightened risk for believers with a misperceived need for God, as explained earlier. Christ is more than your problem-solver; He is your very life (Col. 3:4). Why bother about your daily devotional life? Many Christians ask this very reasonable question. I will show you how your relationship with the Lord has a huge, practical impact on all areas of your life. If something does not solve an emotional pain, financial crises, health turmoil or relationship unrest or similar daily to day issues we face, they turn to matter less to us. Your life, both spiritual and physical, is like a tree. The leaves indicate the overall well-being of your body, soul, and spirit. The fruits are virtues like love, joy, peace, and righteousness, all characteristics both God and man desires. A tree planted by a river will never run dry, even when the sun is high above in the sky. The secret to its fruitfulness is not the tree, but it’s proximity to the river. Simply stated, to flourish in life, plant yourself by the living waters of God. This is where your daily devotional life comes in. It opens the flood gates for the Holy Spirit to nourish your relationship with Christ. Devotionals bring you to the water of life, to abide in Christ every day. For many believers, their mindset and routine has planted them in a dry place far away from the River, and they wonder why their leaves are drying up and they struggle to produce fruit. So why should you care? Your fruitfulness in life will depend squarely on where your practical, daily habits plant you. Today we understand the phrase “daily devotional” to mean a short piece of Christian writing, often based on scripture, for each day. Even Wikipedia defines a daily devotional as such! Check out their insightful article here. However, your devotional life is more than reading a brief, inspiring, encouraging Christian writing every day. Neither is it mumbling a few word of prayer every day. Let me use two simple real-life examples to illustrate the concept of the daily devotional life. How many of us doubt the importance of proper daily nutrition for a healthy body? If we make careless nutritional decisions, we might be leaving the earth to be with the Lord sooner than we think. I hope not! The body must be cared for, whether you are a Christian or not. We do not eat our daily meals solely for pleasure. Daily meals provide the vital nutrients we need to stay productive. Even after you eat breakfast, you might decide to go to a restaurant with your colleagues to have lunch. This meal might be a pleasure meal, and not really vital. Just as your body needs a daily portion of nutrients to live and function, your spirit also needs a daily dose of the Word of God to “stay alive” and operate. Do you remember Jesus saying man does not live by bread alone (Matt. 4:4)? Your body needs to be nourished and cherished( or taken care of). If you can translate this understanding to the spirit, then you have an idea of the concept of the devotional. It is the nourishing and cherishing of the spirit man through the Word of God and in fellowship with Him in prayer. You regularly go to the gas station to fill your gas tank, don’t you? Just as gas fuels your vehicle, daily devotionals fuel your spirit. Though we are already filled to the full at salvation, as long as we are still in this earthly body, we must regularly refuel our spiritual tanks. Trying to live a fruitful Christian life loving others, without practical fellowship with the Spirit, is like trying to drive a car on an empty tank. It will certainly crash. We will visit this idea more later. The word “devotional” is not in scripture, but the concept is everywhere. Therefore, it’s more important to grasp the idea of a daily devotional than the definition. Please read the following core concepts of daily devotionals carefully to ensure you have an introductory understanding of each. The central pillar that holds every other idea of the devotional is that man was created by God to live by the Word of God. As a believer, Jesus (the incarnate Word) is not only the life you were given, but you live by Him. We will visit this idea again later. The Christian life is a life devoted to God. Your relationship with God will require devotion, commitment, and sacrifice. You don’t give God the remnants after other activities have already used up your best. A healthy Christian life will cost you something. If it does not cost you anything, it will be not be worth anything. It will be practically meaningless to you while living here and now. The cost will be paid with your time and attention rather than your money. We will expand upon this later as well. The cornerstone of daily devotional time is essentially that: time spent with God. This alone time with God keeps you practically alive in the spirit from day to day, just as necessary nutrition keeps your body going! There is no shortcut in spiritual things. You cannot serve or tithe your way around this. You need time, alone, with your Father, as long as you are still in this earthly body. When the new body comes, we will not need to find time to spend with God, as He will be perfectly immersed in all of our being. We will forever and completely experience His full presence. But until then, time with God is the only way to realize the dream of living in God’s presence and experiencing His daily manifestations. Fellowship with God describes our state of being together and talking with Him. This has two parts. First, Christians experience fellowship with God, beginning at salvation, by virtue of our spiritual re-birth. The second part is the practical fellowship that revolves around nurturing your time with God. Our daily devotional time must be dedicated to focusing solely on Him, being in His presence, hearing Him and talking to Him. Beyond the devotional life is an even more intimate connection- learning to maintain fellowship with God all day long. This is even more important than your devotional life! It is learning to cultivate God’s presence, no matter where you are or what you are doing. The devotional life is a critical foundation for building this 24/7 fellowship. So what is daily devotional? I define it as a daily moment of nourishment in the presence of God. You can craft your own definition from the basic concepts presented above! The ultimate purpose of the devotional life can be summarized by Jesus statement below. The devotional life keeps you practically in touch with the Master. It keeps you in a place where you continually receive, from a practical perspective, life from the Master, as a branch receives sap. If only believes will be in this place! The issue is that many of us are saved, connected to the Master by default, but living so far away as completely cut off from the daily flow of His life. The Secondary purposes of daily devotional time is to allow the Holy Spirit to complete His multi-faceted ministry in our lives. I will briefly present three of the Holy Spirit’s activities which are most pertinent to our discussion. 1. Feeding and nourishment your spirit. This is receiving the life of God into your soul to live in the here and now. The devotional life matures your spirit man to grow in maturity and Christlikeness. This is God’s heart’s desire for His people. The Father and Jesus fellowship with us through the Spirit as we feed on the Word and spend time with Him in prayer. This is a big issue.If you forget everything, remember this one, that life requires preparation. We prepare to take exams. We prepare for job interviews. We prepare when a baby is coming to our home. Yet many believers face the daily pressures of life completely unprepared. Have you ever wondered why ministers often seek God in prayer before ministering? Is it some formality? Could they postpone seeking God’s face until after they have ministered? Certainly not! They do it before the ministration. Why? The spirit, soul and body need preparation. The same is true about your daily events in life. I have encountered many Christians who start praying only when they encounter a crisis in their lives. They circulate prayer requests hoping it goes viral and enable them muster a large number of praying believers so they can try to “catch up”. It does not work this way. It is hard, very hard, to start build faith when you already are in trouble. The key is to be prepared always. I attended a conference by Ps Benny Hinn and heard Him say the Holy Spirit needs His tools to work in your life. His tool is the Word.Let these words sink into your heart.The Spirit’s influence in your life is directly proportional to how much of His Word has you. I often say this as I minister, that there are no short-cuts in spiritual things. You cannot sow a seed to replace the need for feeding on His Word and spending time in prayer with the Lord. A healthy spiritual life will cost you something. If your spiritual life cost you nothing, it will certainly turn out to be worth nothing. The cost is not going to be some big sum of money or a 40 day or dry fasting. One sure prize to pay is time with God, consistently in His Word and in prayer. It is proper that, after explaining what a daily devotional life is, we should also discuss what it is not, in order to frame our reference and understand the limitations. The devotional life discussed here is not reading a daily devotional writing each day. Yes, we refer to these short, encouraging, Christian writings as “daily devotionals”; however, we now know that these writings are merely a tool that can be used during devotional time. Do not be satisfied and become complacent, thinking these short writings suffice for the essence of devotional time. It may be part of your routine, but a brief writing does not replace the nourishment of time with God in His Word! Your daily devotional life is not a means to prove your devotion or commitment to God. Do not allow yourself to start thinking God feels better about you because you are doing so well with your daily devotional life, or vice versa. This is a deep pit of the religious spirit that you must not allow yourself to fall into. Beware of creating a religion out of your devotional time.For example a believer might end up thinking God loves them more after they have established a consistent devotional life. These are the first signs that religion, rather than the reality or the substance is taking over. The devotional life is not some form of daily inspiration for you to get by the affairs of life. Tons of christians are looking for some bible verse or short piece of material to “inspire” them each them. Inspiration is certainly a major operation of the Word of God in our lives but again, the devotional is much more than that. God did not give His Word solely to inspire you each day. His Word will inspire you but that is not it’s ultimate goal for you. He wants you to feed on His Word and live by it. The devotional life is not “christian religion”, which is the phrase I use to describe the condition in which a christian begins to focus on the form of our outward actions rather than the substance. Christian religion occurs when we use what God has commanded us to do and turned it into a religion for ourselves. This is what results when we are fully engage in the form but have no results to prove it.Have you found believers who might seem to be so dedicated to studying God’s Word but their character have not moved an inch despite the 30 years of diligently seeking the Word? This happens to us when religion has replaced substance, and we are engaged in an activity yet completely disconnected from it’s reality. This is not what the devotional life is.It is not developing a lifeless habit of daily bible readings or prayer. The devotional life is not everything in and of itself. While we know that fellowship with God is a core concept of daily devotional time, there is more to the Word than just doing a devotional study. Similarly, there is more to prayer than just your devotional prayer. You cannot grow to full Christian maturity by devotionals alone. You will have to go deeper in both the Word and prayer, beyond the boundaries of daily devotionals. The Father has a daily heavenly meal for you. You have a portion of daily bread from heaven on Daddy’s table. He does not want your seat to be empty at the time of eating. Mary, Martha’s sister gives us an excellent illustration of what it means to sit at the Father’s Table. She sat at Jesus’s feet hearing His Word. Man is made up of a spirit, soul and body. A practical understanding of this truth is one of those revelations in the Word that will without fail command a change in your life. There is a spirit inside of you. Just as your body needs to be nourished and cherished, so that spirit man inside of you needs to be nourished and cherished. If you can understand how the body operates with physical food, then it will be very easy to understand what spiritual food is and how it works. When you eat food, the body first breaks it down to it’s different components( nutrients) in the digestive tract.It then absorbs the nutrients into the blood. The different organs then take up these nutrients from the blood and use them to either build up their structure or help them to function. In other words, the nutrients will ultimately be taken up and become part of the different cells in the body. The nutrients then provide the body the nutrients it needs to either grow, maintain its structure or carry out it’s activities. This is the heart of what food is. When he ate the Word, that is, took it into his heart, it furnished joy in his spirit and the result was rejoicing! If a man is sick and is looking for healing, they should take God’s Word in and it will furnish healing in their spirit that will manifest in their bodies. God’s Word is spiritual food. It furnishes nutrients for life. The daily devotional is feeding upon the Word of God. You can then imagine if you sit at God’s table for weeks, consistently, feeding upon the life of His Word, with all the nutrients that it contains! Spiritual malnutrition is devastating. I have met many people who are depressed or sick and they are crying out to God to help them yet they are spiritually malnourished. God furnishes the nutrients in your life through His Word. If you do not have a clear understanding of how God operates through His Word, it will be hard for you to live victoriously as a christian. God’s Word is your life. It is the tool the Holy Spirit is waiting to use in your life as Ps Benny Hinn mentioned above. Fasting your spirit from it is a quick way to kill joy, divine healing, prosperity, power, etc, your spiritual life. This article is an excerpt from “The Devotional Life: Your Key to a Spiritual Life with Results”. In addition to an in-depth treatment of the subjects above, you will also find a practical guide t an effective devotional Bible Study method. 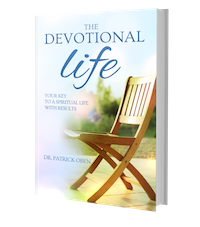 Learn more about the Devotional Life Book. There are times to be sober and a serious, but family devotion doesn’t have to be one of those times! In fact, a child’s delight in God and his word begins with parents delight in God and his word. If you focus on the wonders of who God is, what he has done for you, and what he says in his word, your delight will spill over into your children. Turn on a child to those delights, and you may start him or her on a lifetime of joy in the Lord. Amen to that! That all our children be taught the art of being the Lord consistently. I am considering publishing devotionals. They have been easy for me to write. The problem is I do not want to distort Gods words with what I felt inspired me to write. I guess I am struggling with…is this biblical or something man come up with. He says the path to heaven is narrow and to hell wide. People accept devotionals, but are they Gods will. Are we to encourage in this way? Revelations at the end talks about adding or taking away from the book. I sure dont want to get this wrong! At my end…I want to hear well done my good and faithful servent….not I never new you…or worse yet you confused my people by entangling your words with mine. Help! Can amyone point me to something in scripture that says this is biblical. I think there good and God inspired…but could I ony be deceiving myself. I am not in anyway trying to say devotionals are bad. I have been very blessed by them. I just wanted insight on this huge respinsibility of rightly dividing Gods word. If I offended in anyway, it was not intended. I was just looking for guidance. Penny, thank you for visiting and asking the question. You did not offend at all. On the contrary, your question is a heartfelt honest uncertainty you have and willing to look for an answer. It certainly will be my pleasure to walk you through this. First, praise the Lord for the desire in your heart to share God’s Word.It is a wonderful blessing and privilege to share His precious Word with others. Let me share a few thoughts with you to respond to some of the concerns you raised. First, the word “devotional”. It is not in the Bible. It is a term used to describe a clear and well established Biblical truth which is time taking to spend on God’s Word daily. This is the central TRUTH in the devotional habit. The Devotional is the Word of God as food for the spirit each day. It is our Daily Bread from heaven. This is what the devotional life, the daily devotional, the devotional habit or if you prefer sacred time, quiet a time, etc with God. The key is not the piece of writing but the time we spend in God’s Word daily to feed your spirit. I have extensively discussed this in the Book the Devotional Life where I begin by first explaining what the devotional really is. It is NOT reading a piece of devotional writing every day. This is what many believers have come to think about it because it has become so popular. In fact one of the things I insisted in the book is that WE MUST NOT MAKE OUR DEVOTIONAL LIFE BECOMES ONE OF just reading a devotional writing each day. The key is not the devotional writing but the Word of God you are feeding on. Next, the devotional writing itself. Is it biblical? The piece of devotional writing is not different from a sermon or message preached in Church on a Sunday morning. The difference is that one is spoken and the other is written. A devotional writing is simply a short spoken sermon! Teaching or preaching the Word, or dividing it as you mentioned is simply explaining, expounding or breaking down the Bible verses to help others understand. This is the entire ministry of preaching and teaching which are crucial for the Body of Christ. A devotional writing is simply an expounding of a Bible verse, just as teaching or preaching does, in a short format for easy digestion. This is not only biblical but if only God’s children could get the Word into their hearts broken down as many times as possible! Jesus said to Peter “feed my sheep” three times in John 21:15-16. You do not feed the sheep by just reading the Bible verses to them. You feed them by breaking down the Word to them to understand and be able to apply.The devotional is meant to a short piece of spiritual food. I pray God would multiply a million times and give more Shepherds that will feed His sheep with quality spiritual food even through devotionals! Just as preaching and teaching vary in quality, so devotionals vary in quality. There are some preachings that are purely human thinking or full of stories to “inspire people”. If it is not the Word, people will get inspired, excited but will never be changed or empowered. The same is true of devotionals. Whether is is by devotional writing, audio, teachings or preaching on the pulpit, if you can get the Word of God to His sheep, please do so. The devotional is not everything in itself. You cannot grow to spiritual maturity through the devotional Bible study method. Thank you so much.! I wish I could get your response in PDF, so I could read it as many times as needed. I am going to email this to myself. As I pray about it, I will most likely refrence it. I really wish I could hear God with my ears. Anyways thank you for helping. Be blessed. If you could send me the devotional life book PDF, it would be greatly appreciated. Praise the Lord! You are welcome Penny. The Lord flood your heart with the River of God to fill that good hunger and thirst you have for Him.I have sent a copy of the Devotional life PDF to you by email! Please also read this devotional on hearing God’s voice https://patrickoben.com/hearing-gods-voice/. Blessings. Please let me know if you do not receive your free gift for any reason and will make sure I get it over to you! You are welcome Jairus. Glad to know the Lord has put that desire in your heart for His Word. Thank you Pst Oben for the profound teaching on daily devotionals.I now understand the importance of quality daily devotionals and not a routine reading of a short piece of material to inspire us daily You definitely opened my eyes regarding this May God bless you.